A few days ago I saw this image being shared on social media. It was created in 2002 by Br Robert Lentz OFM, whose artwork can be bought via https://www.trinitystores.com/store/art-image/christ-maryknoll. The image is powerful, discomforting, thought-provoking, un-ignorable, especially after a summer in which we have watched, aghast, as barbed wire fences were erected against Syrian refugees - many of them then herded into camps. As Br Robert says, we cannot tell which side of the fence Christ is on. Is he one with the excluded and with prisoners, or has he come to tear the fence down, liberate us all from our imprisonment, break down divisions and gather us all into one? Is he Christ the refugee or Christ the aid worker? The first thing that struck me, though, were his wounds. Someone unaware of their significance could well mistake them for cuts and gashes caused by the barbed wire. And maybe they are: after all, those wounds come from - and are borne for - a world filled with woundedness and pain, violence, divisions, marginalisation and deep, deep fear. A world in which barbed wire is used to reinforce all these things. 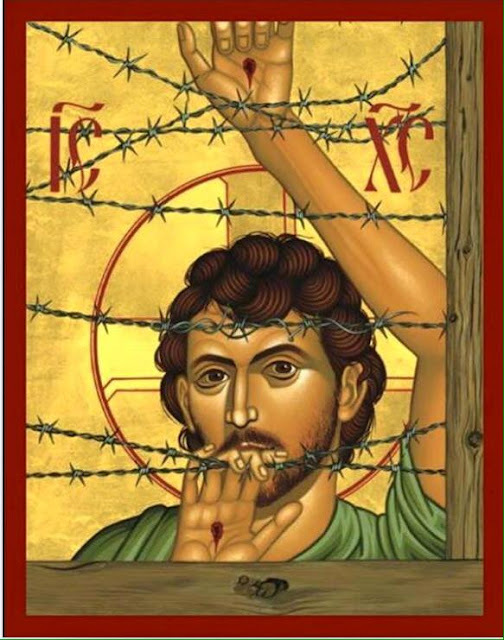 What does this Christ of wounds and barbed wire say to you? There are more divisions in this world than there ever was. More prayers are needed.